This home study program provides an overview of professionalism and scope of practice for massage therapists from the legal, educational, competency and self-accountability standpoints. The roles of professional codes of ethics and standards of practice with regard to ethical behavior and business practices are discussed within the parameters of the National Certification Board for Therapeutic Massage and Bodywork (NCBTMB). 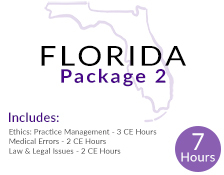 Establishing and managing a professional practice involves knowledge of local, state and federal requirements pertinent to business licenses and permits, insurance coverage and legal business relationships. Successful massage practices provide clear policies and procedures that define the services offered, how appointments are scheduled as well as a competitive fee structure. As always with your programs, this course was very clear, very interesting and your system of online testing (my first ever) was great! I have really enjoyed the at home courses from Integrative Healthcare Studies. I've been using them for 8 years now and recommend them to future students and fellow therapists who I meet. Keep up the great work you all do! It is so helpful to be able to meet the requirements for my license renewal through your courses. I love being able to do them in my own home and my own schedule.